While looking for stones to make a barbecue pit in 1966, Manfred Metcalf picked up a slab of sandstone about 230 mm square at Fort Benning, near his home in Chattahoochee County, Georgia (USA). It carries an inscribed text that Cyrus Gordon (1909-2001) examined after being sent a cast in 1968 by Joseph B Mahan (1921-1995) of the Institute for the Study of American Cultures. He thought it might be an inventory, using a form of the Minoan Linear A script that was developing towards a true alphabetic script, the origin of the Classical Greek alphabet. He linked it with the Yuchi Indians, claiming that, according to their oral history, they originated in the Mediterranean region, and suggested that it was of Canaanite style (Cheesman 1972, 3). Stanislav Segert (1921-2005), a professor of North-West Semitic languages at the University College of Los Angeles (USA), also identified the script as a version of Linear A. In an interview with William F Dankenbring, Cyrus Gordon claimed that “There is no doubt that these findings, and others, reflect Bronze Age transatlantic communication between the Mediterranean and the New World around the middle of the second millennium BC.” He also believed that there might be a connection between Linear A and other Bronze Age Aegean scripts and those of the New World, and that knowledge of the European scripts would assist in deciphering the American; however, Gordon reached his conclusions before significant progress had been made in the decipherment of Maya hieroglyphs, which owe nothing to any Old World types. There are several things worth noting. The ‘text’ has only eight symbols, which is hardly enough to be confident about ascribing it to any particular writing system, least of all one from the other side of the Atlantic. Secondly, the two scholars who passed opinions on it were Semiticists, whose expertise is not in the Aegean script they claim to detect on the stone. Thirdly, Cyrus Gordon believed fervently in Bronze Age contacts between the eastern Mediterranean and North America, a variant of the ‘Lost Tribes of Israel’ theory, despite a complete lack of stratified archaeological evidence for such contacts. 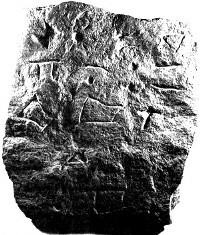 Whether the stone is a hoax or a misidentification of meaningless scratches (natural or deliberate) is unclear, but it is certainly not a Cretan Linear A inscription. Disagree…This is my dad’s find…he is not an archeologist…it is pretty impressive to look at. Thank you for responding to the page, Gary: it’s always good to hear from someone close to the find. Do you have any insights into the nature of the stone that you could share? It looks to me like fairly random scratches on the surface of the stone, not a deliberate script. Also the surface doesn’t look to have been prepared in any way to receive a proper inscription. I’m sure that it’s a simple case of over-interpreting the marks. Thankyou for getting in touch. It’s good to hear from people who are close to the object in question! I am looking for PROOF of ancient inhabitants in America that can be linked to Old World cultures. It there a chance I could see a closeup of your stone? Do not overlook that Dr. Gordon was a former chairman of Mediterranean studies at Brandeis University when attempting to paint him as biased. He merely agreed with Dr. Mahan’s conclusion that the symbols bore strong similarities to Minoan writing as opposed to Cherokee, which was the original theory proposed. Cyrus Gordon may have been Chair of Mediterranean Studies and an expert on Semitic languages. His eccentric ideas about the Semitic origins of Minoan and Greek civilisation have not met with approval from archaeologists or other linguists. There are too few symbols on the stone and they are so poorly carved that it is difficult to know what language they are supposed to represent; it certainly can’t bear the interpretative weight put on it by Gordon as evidence for transatlantic contacts in the Bronze Age. Dr. Joseph Mahan, a historian, was well known to imagine and other misinterpret findings in the little field archaeology he was associated with. He once claimed that fired wall daub (clay with plant fiber tempering)from one Mississippian Period temple had indications of floral motiffs on its surface wheras neither of the two trained archaeologists at the site agreed with him. He finally relented when he couldn’t find anyone else to cooroborate his ‘discovery’ either. But equally, there is no evidence that the stone does “contain script originating on the island of Crete”. The markings are too vague and too irregular to compare with real examples of Linear A. Being Creek Indian (also have some Yuchi in me) I have always been somewhat hostile to those who tried to give credit to Europeans for our cultural heritage, but on the other hand, when I do research I do not have any theories to prove. I merely follow the evidence wherever it leads me . . . and in the process over the past 11 years, our all Native American organization has turned the history books upside down. There are not enough glyphs on the Metcalf Stone to link it specifically to Crete. It may be an archaic writing system from some other part of Europe. Mahan got it a little wrong. The Yuchi Migration Legend says that they crossed the Atlantic from the “Home of the Sun.” There is nothing in the legend to suggest the Mediterranean Basin. Yuchi is the Anglicization of an indigenous American word that means “Offspring from the ocean.” Recent DNA testing has revealed that the Yuchi’s carry a high level of the same DNA test markers as carried by the Saami of Lapland, the Black Irish of County Kerry, Ireland, the aboriginal people of the Orkney Islands and the Basques. There are numerous petroglyphic boulders in the mountains of the State of Georgia, where I live. Many contain glyphs that are identical to Bronze Age petroglyphs in County Kerry and in Southern Scandivania. The Bronze Age Scandinavian glyph for a high king or Great Sun is identical to the glyph used by the Creek Indians for our high king or Great Sun . . . except our usage of this glyph was about 2000 years later than in Scandinavia. This exact same symbol was also used by the High Kings or Great Suns of the Maya civilization during the same time period that we used it! Please read some of the latest articles in http://www.PeopleOfOneFire.com. You will three petroglyphs from Georgia with a strange writing system on them. All three stones have been authenticated by professional archaeologists. One of the stones contains very obvious engravings of Bronze Age European ships. There was also a triangular temple, built out of quarried stones at a mud volcano in Metropolitan Atlanta. The only similar temples in the world were built between around 2200 BC to 1800 BC on the islands of Sardinia, Corsica, Sicily and Cyprus. You go figure. So it now appears that the only “bad archaeology” was practiced by those, who had closed minds to what was going on 3500 years ago. I am not sure yet what was going on, but it seems to be a whole new chapter of world history. in closing, I would like to thank HRH Prince Charles and his staff at Clarence House. I wrote him three years ago and asked for his help in finding priceless documents that had been lost for 285 years. By golly he did! He assigned his Asst. Private Sec., Dr. Grahame Davies to help me and we found those lost documents in Lambeth Palace. They prove that the Creek Indians had a complete writing system before the arrival Europeans. It was derived from the Olmec writing system. Life is indeed a box of chocolates.